Last year when I switched to a low-carb diet I wished I had something like Instruments for my body, where I could observe changes in various parameters throughout the day. Later I learned that's basically what a continuous glucose monitor is. It's like an Instrument that measures one parameter — blood glucose — and lets you graph it over time. To use one, you need a prescription for it, you need have to have it embedded under your skin, and it has to be replaced every so often. Kind of a hassle, not something I feel like doing. There are rumors that Apple has secretly been developing a non-invasive CGM. It would be amazing and an absolute game-changer if this is true and Apple has it working well enough to be useful, i.e., accurate enough to inform day-to-day decisions about diet and medication. This would mean they've solved technical challenges that other companies have been trying to solve for years — which is not impossible, but I'm not going to hold my breath or jump to any conclusions. I'm just going to wait and see. If Apple plans to attack the world's diabetes problem, I wonder if a more likely scenario is that they'll announce a partnership with Virta. Purely fanciful speculation on my part, in the fine tradition of pre-WWDC baseless rumor-mongering. I make the connection in my mind because Virta takes a technology-based approach, because it is an ambitious startup that aspires to attack diabetes at scale, and because Peter Attia, an advisor to Virta, is an obsessive self-measurer and wears a CGM even though he is not diabetic. In "The Swift Programming Language (Swift 3.1)" the terms "argument label" and "parameter name" are misnomers. I have suggestions for solutions. Programmers often use the terms "parameter" and "argument" interchangeably, but they have distinct meanings. A parameter is a specification of a value that a function expects to be passed to it. It is an inherent part of the function signature. A programmer who calls the function needs to understand this specification so they can call the function correctly. An argument is an actual value that is passed to a function when the function is called. The programmer who implements the function needs the argument to have a name so their code can reference that value. According to the docs, "toward" is the argument label and "person" is the parameter name. This is backwards, because the "toward" is the part that the caller of the function must get right, whereas "person" is a local name that's used in the implementation of the function, and that doesn't matter to the caller at all. The word "toward" is part of the function signature, whereas the word "person" isn't. If we use the conventional meaning of "parameter" and "argument", then in all four methods, "toward" is part of the parameter description, whereas "person", "guest", "enemy", and "toward" are different names for the same argument — contrary to the terminology used in the docs. By this reasoning, the most accurate correction would be to use the terms "parameter label" and "argument name". If I only cared about formal precision, I'd leave it at that, but these names feel heavy to me, and still potentially confusing. Another solution would be to use the wording Daniel Steinberg uses in A Swift Kickstart: every parameter has an "external name" and an "internal name". This approach gets rid of the label-vs.-name distinction, and this simplification buys increased clarity — the distinction between "external" and "internal" is immediately clear. As a bonus, the rest of the documentation would be a little more free to use "parameter" and "argument" interchangeably without risking confusion. That might or might not be a good thing, depending on your taste. Yet another solution would be instead to get rid of the parameter-vs.-argument distinction, and call the things "argument label" and "argument name". 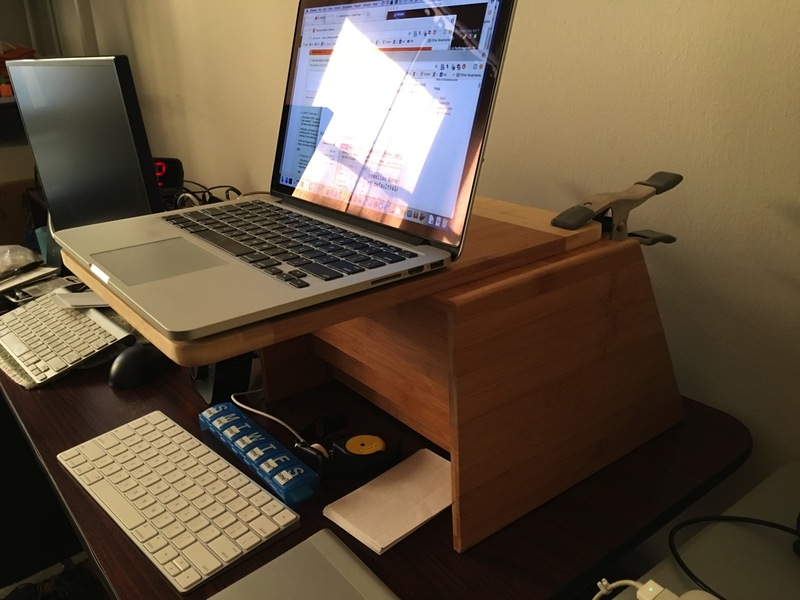 I'm really liking this laptop stand. It's a bamboo cutting board clamped to a bamboo file sorter. Looks nice, very sturdy, and I can either sit or stand. When I'm sitting, this arrangement allows me to bring the screen closer to me than, say, if I rested the laptop on a stack of books. This helps me avoid the habit I have of leaning forward to peer at the screen, which has caused me lots of neck and shoulder pain over the years. The screen is at just the right height for me but might have to be higher for someone taller. Assembly involved no measuring, no cutting, no drilling, and no skills. Also no cost, since it's made from things I already had. I should make this into a kit and sell it at 100% markup. I'd call it "The Diveboard", and I'd make up a bogus story about months of research into design, ergonomics, and sustainable materials. This is a follow-up to my post about Smalltalk language basics. Here I’ll talk very generally about the Smalltalk environment — at least what I remember about it. Like my previous post, this is meant to be a lightweight conceptual orientation. The main thing to get is that the Smalltalk environment is a complete, self-contained universe of objects. The Smalltalk language defines an abstract syntax for creating objects and sending. The Smalltalk environment contains actual objects — things in memory being managed by a running process on your computer — that can interact with each other and that you can interact with. You launch the VM (virtual machine), which is a runtime engine that will interpret and execute all your Smalltalk code. You load a file called a Smalltalk image, which contains a snapshot of the aforementioned universe of objects. Once the image has loaded, you're presented with a UI for writing and executing code. Everything you do in that UI, even something as simple as moving a window, has some effect on that "universe of objects": you're either creating, modifying, or destroying one or more objects in that universe. A rough analogy would be that the VM is like a game engine and the image is like a massive file containing the state of game play exactly as it was when you left off. The image contains descriptions of all the objects that existed in the "universe" when the snapshot was taken. When the image is loaded, all those objects are re-instantiated. Since everything in Smalltalk is an object, including windows, this means all the windows that were open when you left off will re-appear right where you left them. If you had a debugger window that had stopped at a breakpoint in some code that was running, that debugger will re-appear in exactly the state it was in previously, and you will be able to resume executing that code as if you'd never quit Smalltalk, since the execution context was yet another object that was saved in the image. Browser. A browser window lets you browse the source code for all the classes that exist in the environment, including not only classes you wrote but also Smalltalk's built-in classes, which are themselves written in Smalltalk. (Classes are objects, so they are reconstituted and added to the environment when the image is loaded, just like all other objects.) Browsers are where you create your own classes. Workspace. 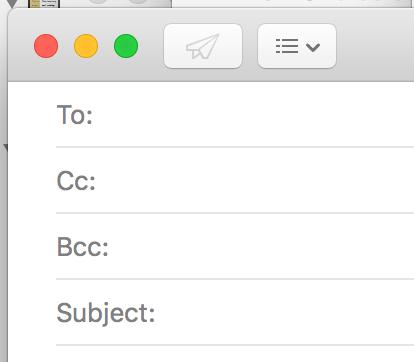 A workspace window is basically a scratch pad where you can type Smalltalk code and run it. Transcript show: 'About to add two numbers. '; cr. x := 3 + 4. Transcript show: 'About to add two numbers. '; cr. x := 3 + 4. Transcript show: x; cr. Inspector. An inspector window displays the internal state of an object — its instance variables. You can open an inspector on any object by sending it an #inspect message (e.g. try this: 3 inspect) or, in some contexts, by right-clicking on it and selecting "inspect it" from the contextual menu. Debugger. A debugger window lets you step through running Smalltalk code, examine code being executed, and inspect the objects involved. A handy feature of Smalltalk is that in general you can modify code in the middle of debugging, and the new code will be used without your having to restart the program you were running. You can open as many of each type of window as you want. You generally open them by right-clicking and selecting from a contextual menu, or by hitting a keyboard shortcut. do it — Executes the selected code. print it — Executes the selected code and prints the resulting value immediately after the selected text. inspect it — Executes the selected code and opens an inspector on the resulting value. There are typically keyboard shortcuts for these actions.